Within one hour of sitting down in the demonstration room we are eating hot homemade English muffins oozing with melted butter and sprinkled with a little salt. They’re not part of the curriculum but Chef Paul wants us to try them because they are so much nicer than bought ones. He generously and enthusiastically provides us with the recipe. We’ll be using the muffins for Eggs Benedict (with salmon rocket and caviar), and also making scrambled eggs and eggs Florentine. Sounds simple enough but we’ll need a velvety smooth bechamel for the cheese sauce for the Florentine, a hollandaise that’s the right consistency so that it coats the poached eggs – so not too thin but not too thick either. And of course, the eggs have to be cooked perfectly. Chef shows us how to poach the eggs by cooking them in acidulated water (1 part vinegar to 10 parts water). We’re going to cook them in advance until the white is just firm and the yolks soft, then carefully remove them from the pan and place them in a bowl of cold water. We’ll reheat them in hot water for about a minute before serving. I love the idea of no longer having to serve eggs to groups of people in relays but how can it possibly work? After the demonstration and tasting, the class of eleven students head to the kitchen. The others have had a short break between Basic and Intermediate Cuisine, but for me it’s almost a year to the day since I started Basic. The space and equipment is of course familiar. But it’s a different environment with an unfamiliar Chef and 10 other students who I don’t yet know. I’m also conscious of what my friends had told me last year about the big step up from Basic to Intermediate. I make the sauces – the lemony hollandaise seems the right consistency and the Sauce Mornay is, well, cheesy and smooth. On with the eggs. My scepticism about pre-poaching is my undoing. I remove the eggs before they are quite cooked thinking they will cook a little more when they go back in the hot water to reheat. Wrong! I present slightly undercooked eggs . 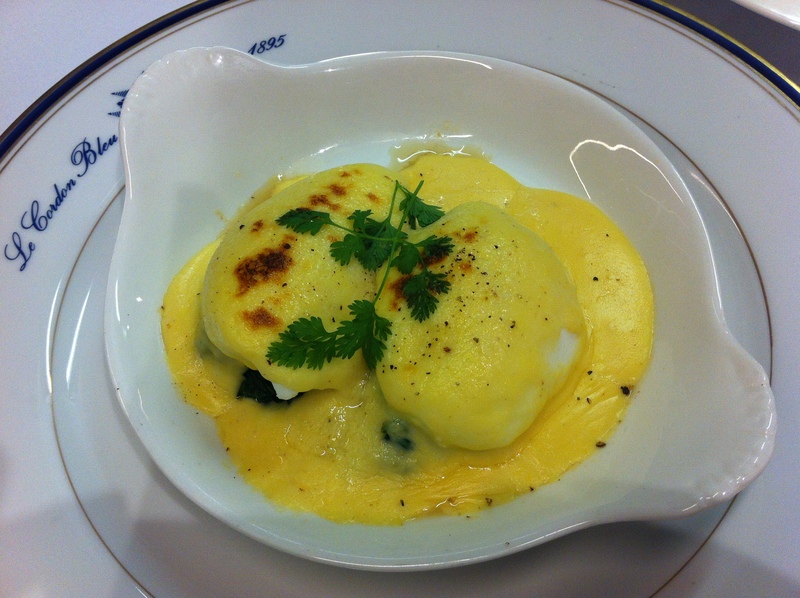 All that effort with the Sauce Mornay and wilted spinach, and the hollandaise out the window. A good lesson on day one that the simple things can be your undoing. PS All the photos are Chef Paul’s. I am so discombobulated about being back in the classroom I completely forget to take any of my own work. Sounds like you made perfect sauces though – and its only day one! Go well, its so good to have you back there and blogging again. Well done you for going to the next level! I enjoy sharing your experiences. Heather – its great to see your fabulous work again! I will enjoy reading your descriptions & devouring the photos whilst I eat porridge & slippery elm. Enjoy every moment – love Therese -now back at 36 ( not inches or years) Pendarves St. Loved reading for first blog and look forward to many more. Week one down already – roll on week Two. Enjoy the experience. Oh Heather, so hard on yourself. Sounds like you cracked the hard bit. 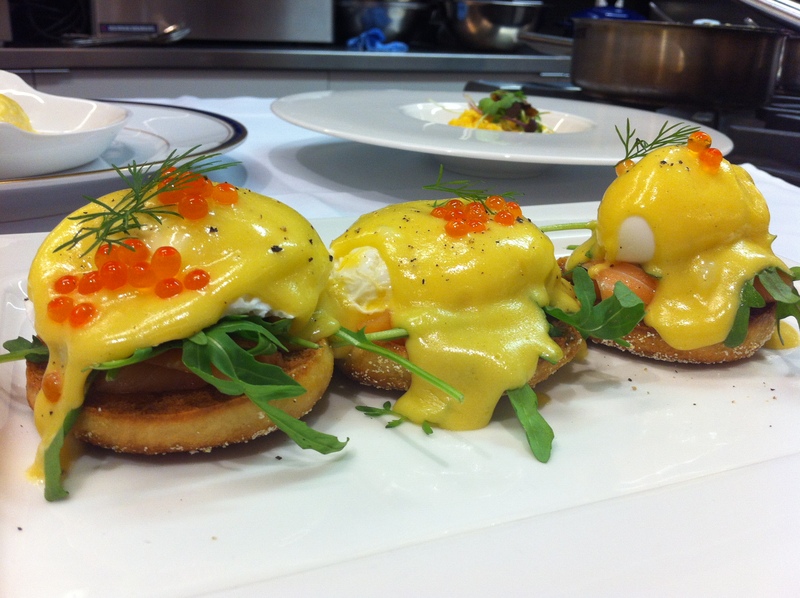 Egg poaching you can practice over and over…..